This double-sided laminated Footprint Card shows people what the footprints of different animals look like. 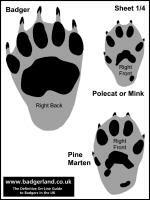 The footprint card includes an outline of each animals foot, together with an indication of the marks made by pads and claws. Also provided is a useful scale, so you can assess whether the prints were made by adults or cubs. School children who may be learning about wildlife. Students studying animal related subjects. Members of badger groups who are learning more about badgers and other wildlife. People involved in surveying badger territories for badger groups or for planning permission related issues. Click the button below to buy a Footprint Card.